As there doesn't seem to be much online about those seven F&SF stories – apart from my own post on "The Golden Brick" that is – I thought I'd write something about them – a niche endeavour, I realise, that serves little purpose other than to interest myself and possibly Hubbard's already niche readership, but then surely that's what blogging is all about. 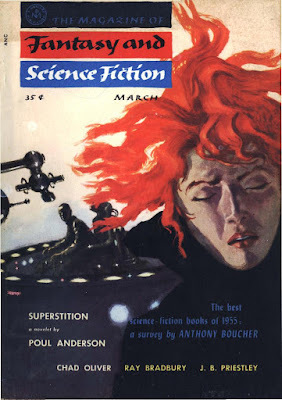 The first Hubbard story to appear in F&SF – and his earliest known story – was actually a reprint, having previously been published in an issue of the weekly Punch sometime in December 1952. 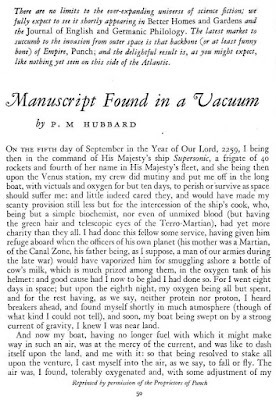 The very short "Manuscript Found in a Vacuum" (US F&SF Vol. 5 No. 2, August 1953, cover by Jack Coggins illustrating Marion Zimmer Bradley's "The Climbing Wave") is atypical Hubbard, a wry, verbose take on vintage space opera that's mildly amusing in its own way but fairly inconsequential as regards the author's wider canon, with little evidence of the intensity of Hubbard's later work. 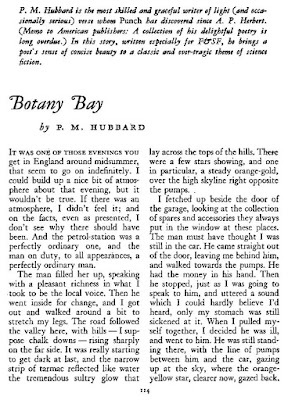 Much more Hubbardesque is his second short, "Botany Bay" (US F&SF Vol. 8 No. 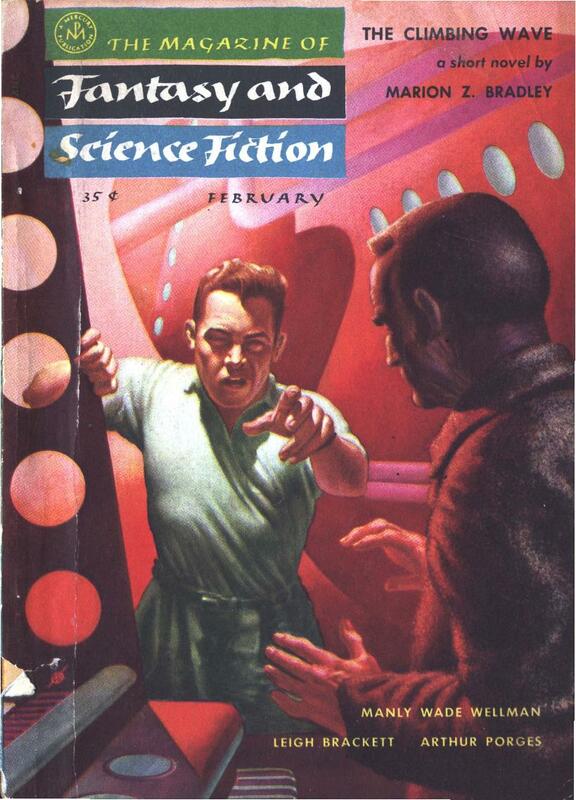 2, February 1955, cover by Kelly Freas), which deploys his "poet's sense of concise beauty", as the story's introduction has it ("the narrow strip of tarmac reflected like water the tremendous sultry glow that lay across the tops of the hills", for example), with hints of his propensity for obliqueness and allusion ("he had a look on his face that needs describing, but isn't easy to describe – not adequately... a look of longing, a sort of shocking hunger, but so overlaid with hopelessness that the impression was one of complete passivity") in service of a story in which a motorist stops at a petrol station and encounters a victim of possible extraterrestrial interference of some kind. 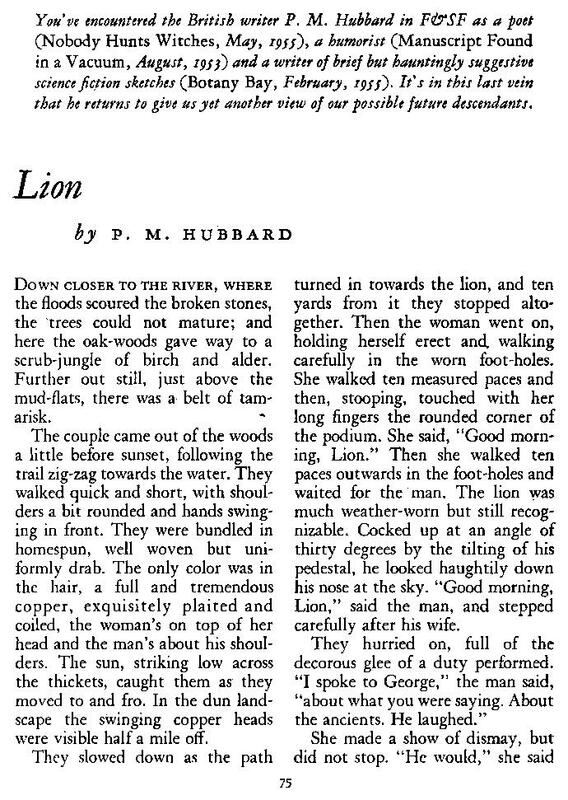 Even more Hubbardian is his third short work, "Lion" (US F&SF Vol. 10 No. 3, March 1956, cover by Nicholas Solovioff illustrating Poul Anderson's "Superstition"). 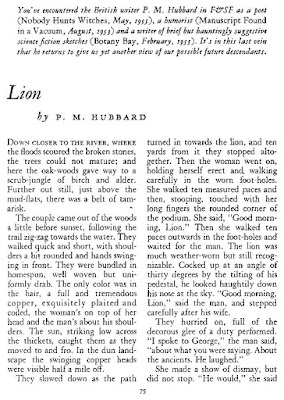 One of three Hubbard shorts – the others being "Special Consent" and "The House" – which might reasonably be described as dystopian or perhaps more accurately post-apocalyptic in nature – although in each case, in true Hubbard fashion, the apocalypse itself is never properly defined – it follows a regressed couple as they gather rushes in an overgrown landscape near a bronze lion statue whilst discussing their more intelligent forebears. Initially I thought that statue and the river the story locates it nearby might be one of the ones in Trafalgar Square up from the Thames, but after further investigation I believe it to be the Maiwand Lion, which stands near the River Kennet in Reading, where Hubbard was born. 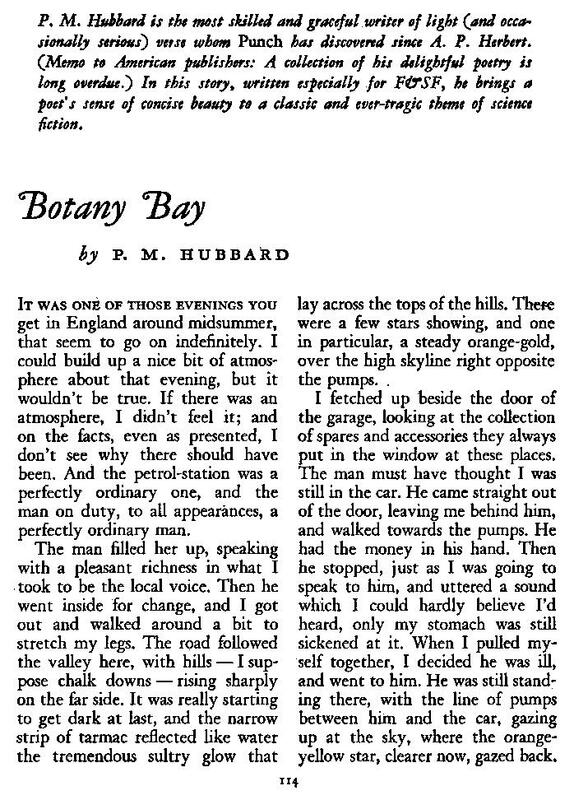 Anyway, Hubbard's evocative handling of the setting is typical of him, and there's a deliciously distressing twist in the tale that I shan't spoil. 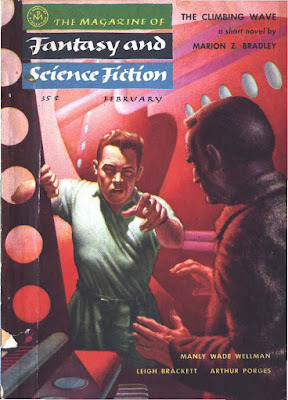 The fourth Hubbard short, "The Golden Brick", I've already written about at length, but arriving at it in this essay does give me the opportunity to expand on one of the difficulties of collecting Hubbard's F&SF stories if you're based in the UK. 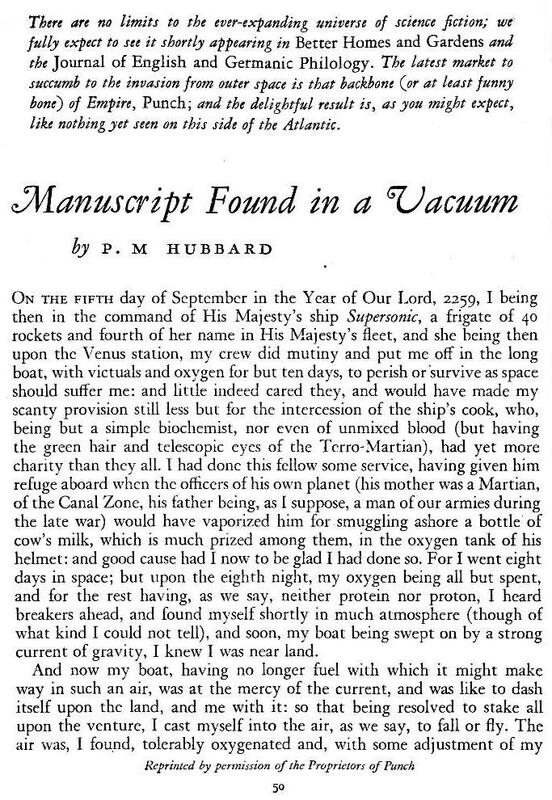 The main source of info about Hubbard and his work is the excellent The Worlds of P. M. Hubbard, but while its bibliography does note which issues of F&SF his stories appeared in, it only gives the American numbers and dates. 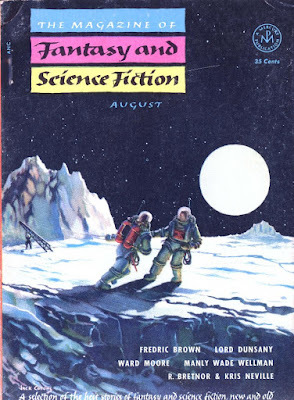 Here in the UK, for the first half of the 1960s a British version of F&SF was published that used the same stories as its American counterpart but not in the corresponding issues (they tended to lag behind by a number of months). So while in the US "The Golden Brick" appeared in F&SF Vol. 24 No. 1, January 1963 (cover by Ed Emsh illustrating Mack Reynolds' "Speakeasy"), in the UK it was in Vol. 4 No. 6, May 1963. In addition, in the case of "The Golden Brick", the US edition boasts a page-and-a-half introduction comparing Hubbard favourably to M. R. James and incorporating a self-penned bio ("My first novel (a thriller of sorts) just accepted for publication this autumn. Married, three children, two grandchildren. Like making things with my hands, planting and tending trees, swimming, sailing. Have cottage in Cornwall. Expect to die early in 1965, but I may crawl away over the sea yet...") that in the edited-down UK edition intro is brutally excised in its entirety. The American intro to Hubbard's fifth short, "Special Consent" (US F&SF Vol. 24 No. 4, October 1963, cover by Chesley Bonestell), is also curtailed in the British edition (UK F&SF Vol. 5 No. 4, March 1964), although nowhere near as savagely. In this second short dystopia, Hubbard paints a scenario where women have risen to dominance after men propelled the planet back to the stone age by unleashing "the Fire". There are some interesting ideas present, but the gabby exposition – not a typical Hubbard trait – and the officious nature of the matriarchal society depicted seem to me somehow off. A more familiar and authentic slice of Hubbard comes with his sixth short, "The Shepherd of Esdon Pen" (US F&SF Vol. 26 No. 2, February 1964, cover by Jack Guagham illustrating S. S. Johnson's "The House by the Crab Apple Tree"/UK F&SF Vol. 5 No. 7, June 1964), in which Hubbard spends a good deal of the story's length vividly establishing the ancient chalk upland surroundings and the social and religious milieu in order to deliver a tale of escalating dread centring on the eponymous horn-headed pagan herder, a carving of whom can be seen in the local church and whose serpent-like staff figures at the story's climax. 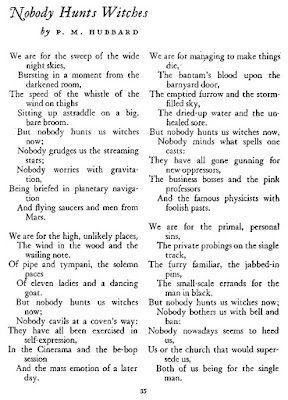 Just as good is "The House", Hubbard's ninth short story overall and his last to appear in The Magazine of Fantasy and Science Fiction (US F&SF Vol. 36 No. 4, April 1969, cover by Bert Tanner illustrating Gregory Benford's "Deeper Than the Darkness"). The third Hubbard post-apocalyptic tale, it shares with "The Shepherd of Esdon Pen" a kind of excavatory epilogue, as a man and his wife try to erect a home and start a new life on their government-allotted square mile of overgrown rubble – all that remains of North London – but find that the going is far harder than they expected. Transplanting a characteristically Hubbardian sense of a sullen rurality to a keenly rendered shattered cityscape ("fairly fine rubble, pretty wet in winter and thickly grown with scrub and the larger annuals, broken by coppices of hazel and alder"), the accruing details – the scarcity of glass, silent birds that might be deaf, the backbreaking work of shifting by hand the "infernal jigsaw" of masonry to find "a reasonably stable and compact surface" to fill in and then level up – build into a convincing portrait of English stoicism in the face of catastrophe. 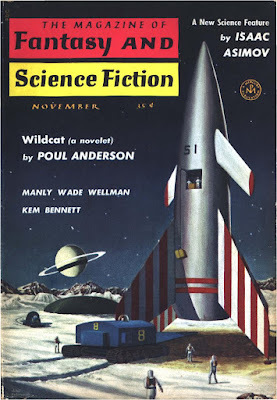 Of the seven F&SF stories, I would say "Lion", "The Golden Brick", "The Shepherd of Esdon Pen" and "The House" are all approaching prime Hubbard and are well worth tracking down; the other three perhaps less so. 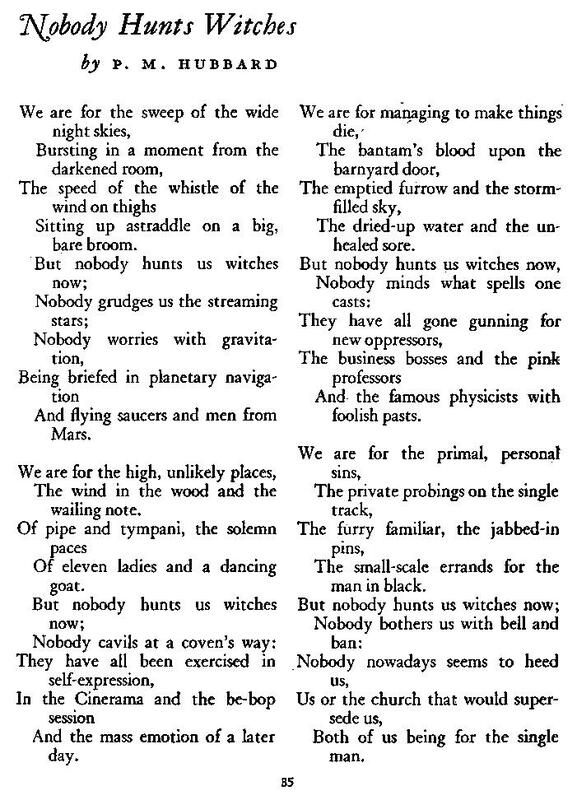 In addition, F&SF ran three Hubbard poems, and these too are worth a read (again, they can be downloaded here). Both "Free Flight" (US F&SF Vol. 10 No. 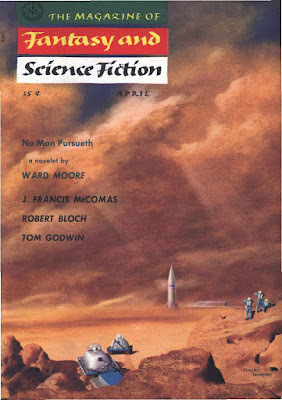 4, April 1956, cover by Chesley Bonestell) and "Air Space Violated" (US F&SF Vol. 15 No. 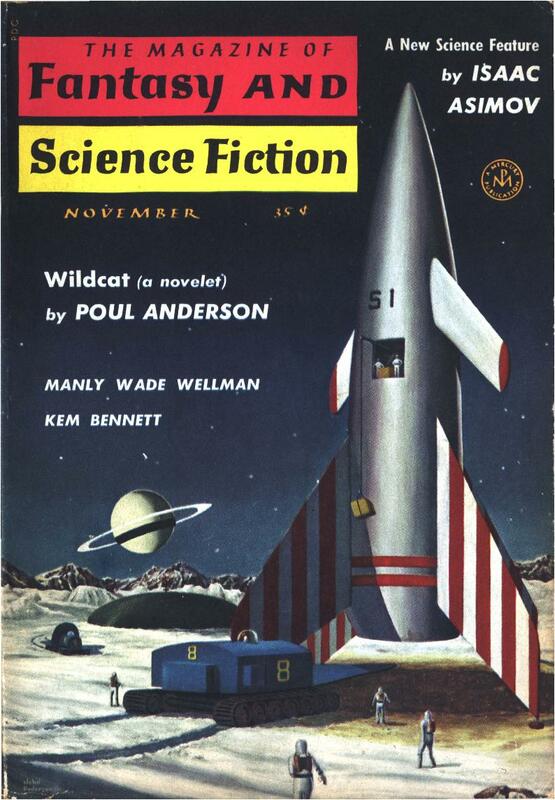 5, November 1958, cover by Pederson) deal to a degree with man's efforts to escape his earthly shackles, but my favourite I think is "Nobody Hunts Witches" (US F&SF Vol. 8 No. 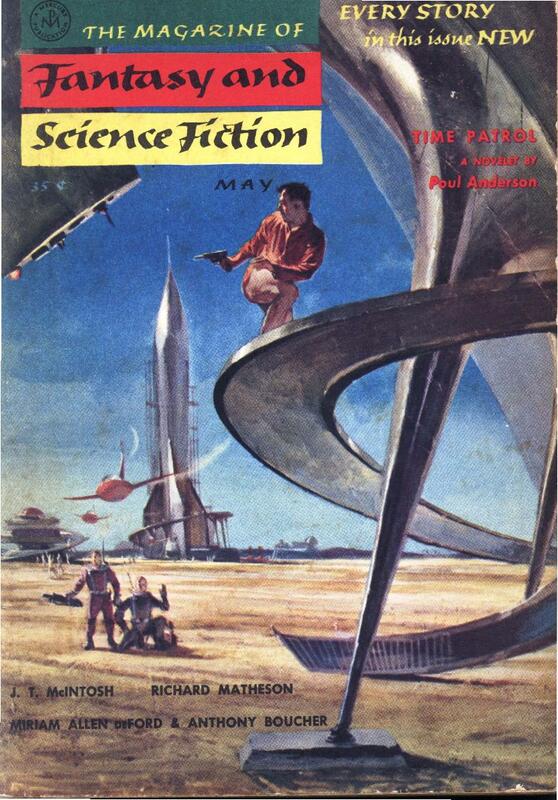 5, May 1955, cover by Stanley Meltzoff). It brought a smile to my face when I first read it, and in that spirit I hope I'll be forgiven for including it in full below. *A year on from this post, I secured physical copies of all three in the basement of the Quinto Bookshop on Charing Cross Road. Linked in Friday's Forgotten Books, 1/12/17.